Last year Lenovo released the Lenovo K3 Note in the Indian market and many mobile phone users bought this smartphone. But most of them are still waiting for the Android Nougat update for the Lenovo K3 Note. But unfortunately, Lenovo didn’t roll out the Nougat update to the K3 Note. And they are not in the mood to release the nougat update for the K3 Note. 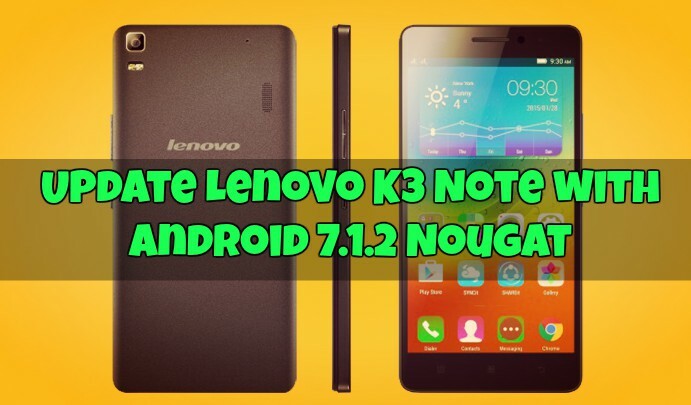 Many users are disappointed with this news that their phone will not get the update and they can’t Update Lenovo K3 Note with Android 7.1.2 Nougat. But don’t worry, there is the solution for you to get the Android 7.1.2 Nougat update on your Lenovo K3 Note. Here in this guide, we are going to show you the steps to install the Android 7.1.2 Nougat update on your Lenovo K3 Note. The steps are very simple and you can easily install this Nougat update on you rK3 Note within a few minute. But before that let me clear that this one is not the Official Nougat ROM from the Lenovo. They already stopped the update for K3 Note and you will not get the official update from them. Here in this guide, you can install the unofficial Android 7.1.2 Nougat. All credit goes to the RESURRECTION REMIX team for creating the Android 7.1.2 Nougat Custom ROM for the Lenovo K3 Note. We tested this ROM in our K3 note and it works so smooth and you can enjoy all the new features of Nougat on your K3 note. As we mentioned above this is the Custom ROM based on the Android 7.1.2 Nougat. So all you have to download two zip file on your phone and you update Lenovo K3 Note with Android 7.1.2 Nougat. So let’s get started and install this nougat update. Make sure to take the full backup of your phone in case something goes wrong you can easily restore all your files. Make sure your device is charged at least up-to 60%. This guide is only for the rooted Lenovo K3 Note users with TWRP recovery. If your phone doesn’t have the TWRP recovery then this will not work for you. Read our guide here how to install TWRP on Android phones. You have to flash two zip file on your phone to apply this nougat update. First one is the Nougat Custom ROM zip file and the second one is the Gapps zip file to install the Google Application on your phone. Now save both the zip files on your phone’s internal memory. 1. Save Nougat ROM and Gapps File on your phone. 2. Once both the files on your phone. Boot your phone in the TWRP recovery mode. 3. Switch off your phone first and Afterwards press and hold Volume Up + Volume Down + Power key at the same time for a few seconds. 4. Once you are in the TWRP recovery main page. Go to WIPE > Advanced Wipe > Select Dalvik Cache, Cache, System, and Swipe to Wipe from below. 5. Now go back to the main screen of TWRP recovery and tap on the Install button. 6. Now locate the Nougat ROM zip file and select it. And Swipe to confirm flash. 7. Once the file is flashed successfully, flash the Gapps Zip file to install the Google Apps on your Lenovo K3 Note. 8. Once both the files are flashed on your phone. Reboot System. That’s it! You successfully installed the Android 7.1.2 Nougat on your Lenovo K3 Note. If you have any questions or facing some problem during installation, then leave the comments below we will help you to fix them. He does not have any. i have downloaded gapps files nd android 7.1 nougat but i don understand how can i install these files nd save in my mobile..